A famous mystery-author, Tamiya Ryûnosuke, is asked to write a new masterpiece in celebration of an upcoming contest for young writers. He is asked to make it into something that belongs to the currently popular New Orthodox Puzzler Genre, even though he has not written a proper mystery in years. Fuelled by the belief of a young student he retreats into the mountains, into a solitary little lodge and starts writing something that is to become the defining piece of his career, Murder in the Spiral Mansion. From time to time people come to visit him and only with much struggle and inspiration by a special someone is he able to finish his manuscript. He hands it to his editor, but only to have it stolen in the process. This is a really tough one to review and I don’t know how many times I had to reformulate some passages to make them seem comprehensible for somebody who hasn’t read the book. It’s not like the book was actually really bad, though it wasn’t really good either, it is just not like any kind of mystery novel I read before aside from Paul Auster’s City of Glass. I have to hand it to Orihara Ichi though, that this was among the books I actually enjoyed having read, because it’s really interesting to talk about. But be warned, this book is not and I can only repeat, really not a mystery puzzler. If anything, and the author of the original’s Commentary seems to have thought the same, this is a parody or at least a comment on writing mysteries in general. The first half of the first part, titled Murder in the Spiral Mansion, really reads similar to many classical mysteries. An old author, locked up in a study, a young female writer in search for help, an idealistic editor who keeps an eye on the strange old man. I was really ready for a classical mystery after that introduction. Then the first plot twist came around and suddenly it felt like I was in a thriller of the Society School, shakai-ha, which came before the New Othordox Puzzler School, shinhonkaku-ha. It had everything, right down to the murder in the apartment complex, without any fancy tricks or anything. Then the second half of the book, titled Rondo of Plagiarism, started and it felt like a high-tension thriller from 90’s or early 2000’s American cinema. At some points I even felt reminded of Korean revenge thrillers like Old Boy. It really threw me off and made me miss some important parts concerning the “solution” to the puzzle hidden within the different parts of the novel, which actually made me slap my head in the end. And then the finale of the main-story came and it drifted into psychological horror territory only to make a curve to something in the end that I expected at one point but stopped expecting again when the second half started. You see, the novel’s plot isn’t really that interesting or disturbing, it’s a well-written thriller I would say. What makes this novel stand out for me is that it is actually commenting and referencing so many different things…and yet it really doesn’t. The author by the way flat-out mocks in the afterword how some people read so much into his works and how they got captured by the spiral within the book. I actually don’t know if he was just kidding or if he really meant what he was saying about the commentary, but it made the novel even stranger when you’re told he wasn’t referencing, he was just writing, and you see those references right in front of your eyes. 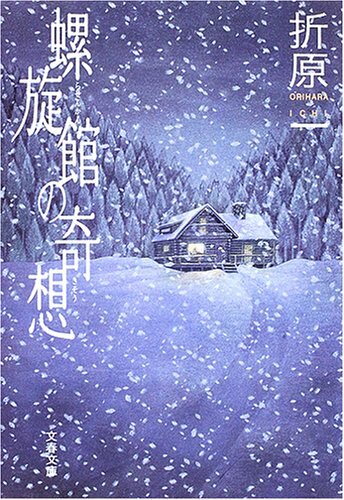 Another funny thing is that the book was originally titled Murder in the Spiral Mansion (螺旋館の殺人) like the novel Tamiya is presenting to his editor in the story’s first half. Also Orihara wrote a series of novels called the Perversion-Series or tôsaku-series (倒錯シリーズ) with the first novel being called Rondo of Perversion or tôsaku no rondo (倒錯のロンド) which is interesting because Rondo of Plagiarism is also tôsaku no rondo (盗作のロンド). All this connected with the tragedy of those characters and the afterword makes a pretty solid impression that he was commenting on his own writing. This is a shame because I haven’t read anything from the Perversion-Series and I actually didn’t plan to do so, but somehow Orihara’s writing actually captured me in the end. Don’t get me wrong, I think the middle-part of this novel was a bore, I actually was short of skipping whole paragraphs because it became so thriller-like with so much information about social circumstances, writing careers, etc. I just wanted it to end. The thriller part was well written, but I was worn out by what came before and I didn’t actually expect it to redeem itself for me but on the last 50 pages it became so tense and interesting again I couldn’t put it down. Yes, like I said in the beginning, I have actually no clue where to put this novel. I definitely can’t recommend it like Ayatsuji or even Kyôgoku, but I can’t do the opposite either, like with Utano or Otsuichi. It’s kind of similar to Shimada Sôji’s debut, it was interesting, it was necessary, but it had too many weak points to make me call it a good book. Though, if you are into thrillers, shakai-ha, mystery, meta-fiction, basically all of that, the novel could be your cup of tea because it has everything, but it could as well be not, because it’s none of those completely. ~ by seizonsha on 2011/03/01.